The film-maker underwent surgery for throat cancer. 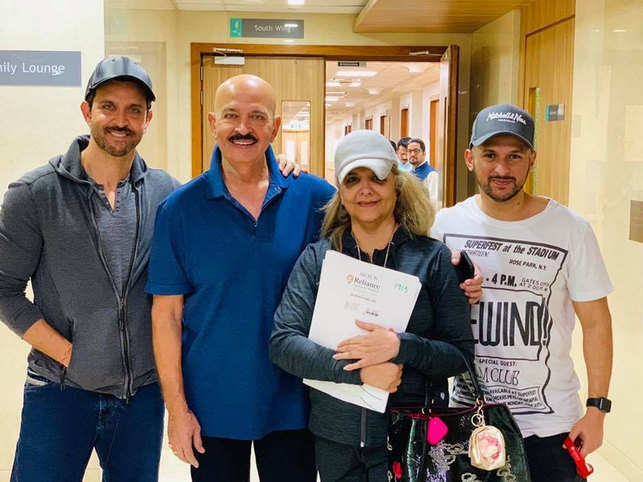 Hrithik Roshan posted a picture of the family leaving the hospital on social media. Earlier, Junior Roshan had posted an update from the hospital saying that his father was up and about after the surgery. Hrithik, who turned 45 on Thursday, had celebrated his birthday with him and other family members in the hospital. The news about the 69-year-old director's cancer diagnosis was shared by Hrithik via an Instagram post earlier this week. In the post, he wrote, "Asked my dad for a picture this morning. Knew he wouldnt miss gym on surgery day. He is probably the strongest man I know. Got diagnosed with early stage squamous cell carcinoma of the throat a few weeks ago, but he is in full spirits today as he proceeds to battle it. As a family we are fortunate and blessed to have a leader like him. .Love you Dad." The revelation was followed by recovery messages pouring in for the film-maker. Prime Minister Narendra Modi had also tweeted recovery wishes for the director.